This guide provides advice on how to search for and locate records of immigrants to England and Britain from the 13th century onwards. It also covers records which reflect government policy towards immigration over the last 800 years. The National Archives is the archive of central government in the UK. The immigration records we hold were originally created by the various government departments that recorded the arrival and existence of foreign nationals in Britain, as well those that formulated the government’s immigration policy. Many records of individual immigrants have been destroyed so tracing someone’s arrival can sometimes prove impossible. There is no comprehensive index of names for immigrants. Many of these records are records of ‘aliens’. An alien is someone who is born outside the country and does not have English parents (before 1707), or British parents (after 1707). You may also wish to consult one of our other research guides on related subjects, listed in the right-hand panel of this page. Look out for the grey boxes in this guide – they indicate that the records described are available online. Many of our records of immigrants are records of ‘aliens’. An alien is someone who is born outside the country and does not have English parents (before 1707), or British parents (after 1707). From 1707 English and Scottish subjects were British subjects and from 1801 Irish subjects were also British subjects. If immigrants came to Britain from the British colonies they were not classed as aliens but were simply Britons. Search incoming passenger lists from BT 26 on Ancestry.co.uk (£) for people arriving by sea from countries outside Europe and the Mediterranean area. For more information see our research guide to records of passengers. There are no passenger lists for people arriving in the UK by air. Search and download certificates of alien arrivals (HO 2) and returns and papers (HO 3) at Ancestry.co.uk (£). Search by name of alien, date or port of arrival and country/place of origin. HO 3 consists of returns of alien passengers made by masters of ships under section 2 of the Aliens Act of 1836. The lists survive for the period July 1836 to December 1869 but none survive from January 1861 to December 1866. Earlier records relating to the arrival of aliens and aliens’ accounts are in local county archives, normally among Quarter Session papers. For example, certificates of alien arrivals issued at the port of Hull from 1793 to 1815 are held by Hull History Centre. Surviving in series HO 5 are entry books recording the out-letters of the Home Office and the Aliens Office relating to aliens and naturalization. Browse and download aliens’ entry books, 1794–1921, including indexes to certificates of alien arrivals (HO 5/25–32) at Ancestry.co.uk (£). HO 5 includes registers of applications for denization, naturalization and exemptions, and indexes to the certificates of arrivals in HO 2 (see above). Immigrants arriving from outside England or the United Kingdom were unlikely to have belonged to the Church of England. Those that retained the religion of their homeland would have had births, baptisms, marriages, deaths and burials recorded in non-parochial registers – where they were recorded at all. Search the non-parochial birth, marriage and death registers from RG 4 on The Genealogist website (£) for records of births, baptisms, marriages, deaths and burials of refugees kept by the French, Dutch, German and Swiss churches for various periods between 1567 and 1858. All of the Dutch registers, and some of the French and German ones are for those countries Chapels Royal, but most are French (Huguenot) or German (Lutheran) church registers. There is only one Swiss church register. For hundreds of years, foreign nationals living in the UK have been able to attain British citizenship through naturalisation. The National Archives holds records of naturalisation up to 1 October 1986. For records since 1 October 1986 to the present you should go to the United Kingdom Visa and Immigration Service. Denization was a legal process granting limited naturalisation to aliens. It granted a foreign national almost equivalent status of native-born Britons and provided them the protection of the law. For more information about denization and naturalisation and advice on how to find the related records, see our research guide to records of Naturalisation, registration and British citizenship. Some of these records are of people who were interned but others are of people who were exempted from internment. You can search by first and last name for British internment records from the First and Second World Wars on findmypast.co.uk (£). These online records are drawn from HO 144/11720, HO 45/11522, PCOM 9/661 & 662, nominal rolls in HO 215, and the internees index in HO 396. The Aliens Department internees index in HO 396 (1939–1947) give details of mostly Germans, Austrians and Italians and their spouses who were interned or considered for internment by tribunals during the Second World War. Most of the index cards which make up this series were originally issued in September 1939 when the first round of decisions on internment were made. They were reused for later tribunals that took place in the early 1940s when larger numbers of resident aliens were interned following panic in Britain about the course the war was taking. Those interned included Jewish refugees who had escaped Nazi persecution. They contain personal details on the front and sometimes information about the individual’s case on the reverse. Access to records of individuals who were interned is partially restricted, with only the front of the internment card open to access without restriction (see below for advice on accessing restricted records). Cards for aliens who were considered for internment but were not actually interned, also held in HO 396, are open without restriction. An Exemption From Internment Card (catalogue reference HO 396/180/00136). 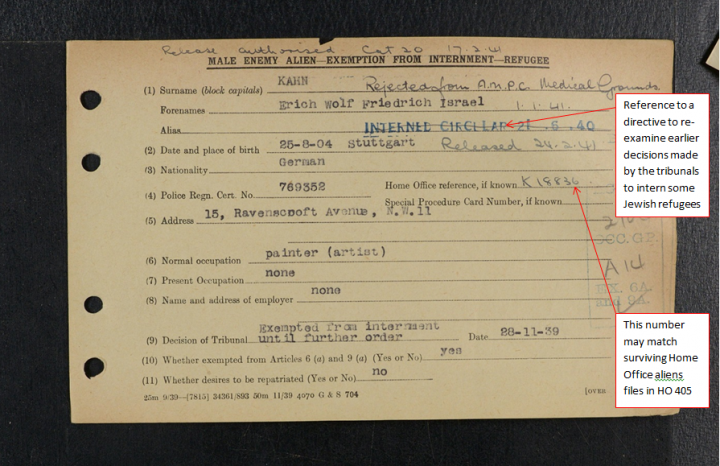 The card shows that although the person in question was exempted from internment in 1939, a decision was then made in 1940 to intern the individual, whose release was then authorised in 1941. You can request the opening of restricted records under the Freedom of Information Act 2000 by filling out our Freedom of Information enquiry form or by writing to our Records Enquiry Service at The National Archives, Kew, Richmond, Surrey TW9 4DU. This collection details the development of policy for the screening of internees at the Royal Patriotic School (RPS) between January 1941 and June 1945. The London Reception Centre was established to process aliens arriving in the UK, to gather intelligence from them on conditions in occupied Europe, and to screen arrivals for possible enemy agents. The screening centre for men was located at Trinity Road, Wandsworth, and at nearby Nightingale Lane for women. The files contain only passing references to individual cases, with a few exceptions. People other than those from British colonies or Ireland had to register with a Justice of the Peace, giving their name, rank, address and occupation. The records of Justices of the Peace may survive in local record offices. In 1905 a new Aliens Act meant that aliens could only enter the UK at the discretion of the authorities. After 1914 they had to register with the local police. Search a sample of Metropolitan Police aliens registration cards (£) for the London area, dating from 1914. These records are from MEPO 35. Owing to the sensitive nature of these cards, they are closed during the lifetime of the individuals concerned or until they can be assumed to be deceased. See section 5.1 for information about how to request restricted records under the Freedom of Information Act. German Palatines came from the Middle Rhine region of what is now Germany, but was, in the early 18th century, part of the Holy Roman Empire. Thousands of them emigrated to England in 1709. Lists of names traced in these series have been printed in WA Knittle’s Early Eighteenth Century Palatine Emigration; LD MacWethy’s The Book of Names Especially Relating to the Early Palatines and the First Settlers in the Mohawk Valley; and in The New York Genealogical and Biographical Record, XL and XLI. In 1793 the Aliens Act introduced the first official immigrant registration system. It was introduced to manage the influx of people coming to Britain to escape the French Revolution. A descriptive note about all these letters and papers, and a full list of them in typescript, is available in the Open Reading Room. There are also names in registers and on pension lists in Treasury records of the French Refugees Relief Committee (T 93) for the period 1792 to 1828. These are described in PRO lists and indexes, no. XLVI (1922). Searching for records of immigrants from the early modern and medieval periods involves largely speculative searches, though there were some sets of records from these periods created specifically to record immigrants or refugees of one kind or another. The earliest references to immigrants in England are in records of Chancery and the Exchequer. Use the England’s Immigrants database to search for records of immigrants living in England between 1330 and 1550. These records are drawn from alien subsidy returns in E 179 (see section 9.2) and letters of denization in C 67 (see section 9.4). From 1560 onwards the state papers domestic contain names of Huguenots from France and Walloons from the Low Countries who emigrated as a result of Spanish persecution. Some lists of the people mentioned in the above records also appear in the printed Calendar of state papers, domestic, Edw VI to James I (1537–1625), Vols I to V, which each have indexes and can be searched using State Papers Online (£) (institutional subscription required – access is free on the public computers at The National Archives) and British History Online. You may be able to find names in the indexes to the printed calendars of SP 14–16, 18, 29 and 30. Short lists of names can also be found in J S Burn, ‘The history of the French, Walloon, Dutch and other foreign Protestant refugees settled in England from the reign of Henry VIII to the revocation of the Edict of Nantes’. Lists of denizations of refugees escaping from the persecution of Huguenots in France, 1681 to 1688, are available in William A Shaw (ed), ‘Letters of denization and acts of naturalization for aliens in England and Ireland, 1603–1700’. Treasury in-letters (T 1) contain references to refugees and other foreign people who received annuities, pensions and other payments for their support, or in return for services rendered to the Crown. These can be traced in the indexes to printed volumes of the Calendar of Treasury papers, which covers the period 1556 to 1745. Most of the following publications are available in the The National Archives’ library. You can visit The National Archives bookshop for a range of related titles.